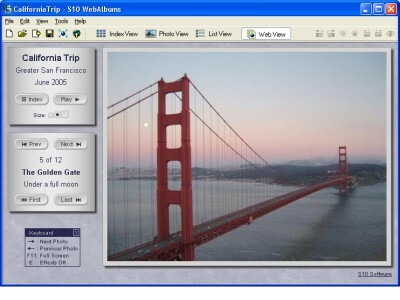 Easily create elegant web photo albums and publish them to your own web space. Includes instant Web View, drag-and-drop adding/reordering, photo editing, titles/descriptions, themes, pattern library, border styles, layout options, slide show, FTP. S10 WebAlbums is digitally signed, compact (461KB), inexpensive ($9.95), and easy to use.